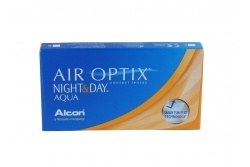 Air Optix contact lenses,created by Alcon, are the ideal product for those who suffer from ocular dryness. These contact lenses are characterize because of their high oxygen transmission. Thanks to this it is possible to wear them for long periods of time without feeling any kind of discomfort allowing the cornea to breathe. These novel contact lenses thanks to the innovative use of the material called Lotrafilcon B and also to a high hydration rate. Thus, Air Optix are capable to keep the eye hydrated for more time than the conventional contact lenses.